The ultimate "non-prescription" alternative for men, formulated to out-perform any other product on the market. Feel the intensity with its powerful testosterone boosting, stimulating, and circulation enhancing ingredients - including Androstenedione, Yohimbe Bark Extract, Avena Sativa, Saw Palmetto, Guarana, L-Taurine, Siberian Gingseng, Tribulus Terrestris, Panax Ginseng, Rhodiola, Wild Yam Extract, Maca, L-Arginine, and Niacin. Should we say more! Other Ingredients: Di-Calcium Phosphate, Magnesium Stearate and Stearic Acid. 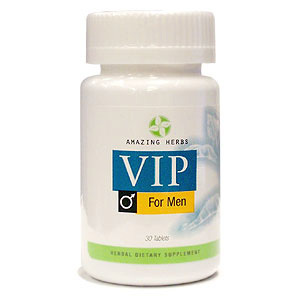 VIP For Men is shipped in a discrete, unmarked package. Orders are processed immediately and usually take about 3 to 5 working days to be received. We do ask that you try it for 2 to 3 weeks to feel the full effects. Any information received is used only for order processing and shipping purposes. Your information, such as e-mail address, will never be disclosed to a third party.